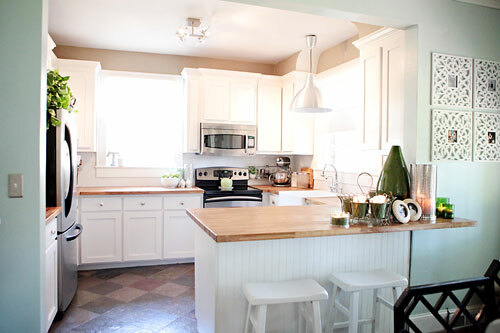 After Jordan and Landon shared their amazingly affordable (and drop dead gorgeous) kitchen overhaul with us (here), we definitely were left wanting more. So when they offered up the opportunity to House Crash them, we said “uh… yes please.” And we figured since it’s their house they’d be the best at showing you around, so we’re passing the virtual mic over to them for the tour while we clean our house within an inch of it’s life in an effort to woo a few more potential buyers this weekend (fingers crossed). Enjoy the tour! Welcome to our home in Columbia, South Carolina! We’re Jordan & Landon from landonjacob.com. This is our dining room. The wine bottles come from one of our favorite wedding venues that we shoot at often! We had them hold the bottles for us (and we bought a bottle cutter on eBay). That’s actually a DIYed mirror leaning against the wall. We bought mirrored closet doors on Craigslist for $40 for the pair and then found an old weathered pallet, took it apart, and made two mirrors (one for in here and one for the hallway). Our dining table is an amazing thrift store find that people ooh and ahh over. It was just 10 bucks! The chairs and bench were bought at a yard sale, and the ottoman was a throw out item from a friend. As you can see above, Landon made two frames out of more pallets. 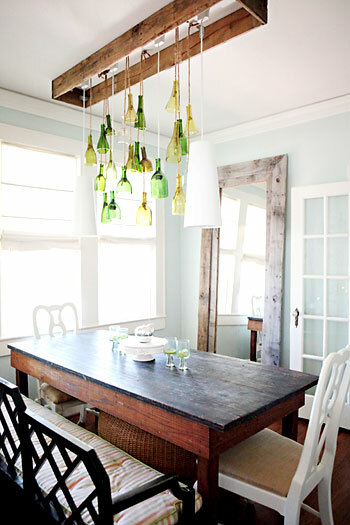 We really love that rustic wood (its kinda all over the house). We made that ottoman which was actually inspired by Kara’s DIY ottoman that you shared! Oh and that old wine bottle crate in the foreground works as an awesome magazine holder. We also love our little DIY end tables which we made from vintage suitcases on legs. We also like those hanging baskets from Ikea on the wall next to the sofa (it was actually an idea we stole from the ikea catalog). The doors on the wall above the bookcases are original doors from the home, so we wanted to incorporate them into the room. Next we have our master bedroom, where we added the beadboard wainscotting ourselves and hung a bunch of inexpensive frames that I sprayed white on the wall in a group. And here’s our master bath. Can you tell we have a think for big mirrors? 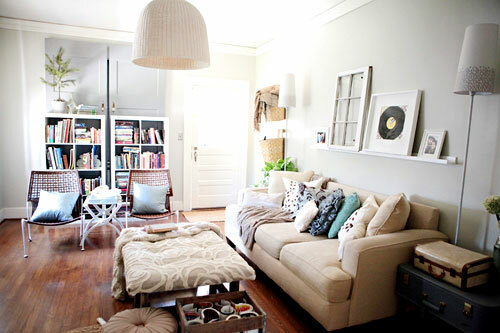 We love how they open things up and make rooms feel lighter and bigger. This is our awesome little hallway! Its my favorite space in the house! Its about the size of our other rooms! The chairs were thrifted for $40 and we recovered them. That’s also the second homemade mirror that we made with the mirrored doors from Craigslist and the weathered wood pallet. We also grabbed that lotus light fixture from Ikea. 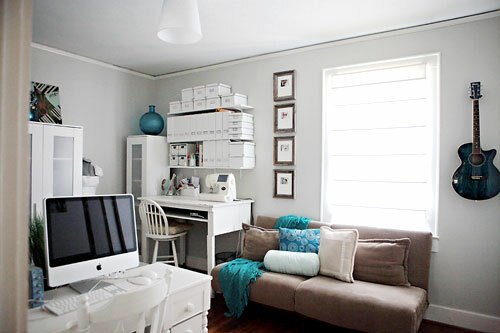 This is our office / crafts room. We thrifted that awesome craft table for 5 bucks. We also love instruments (we love music around here since my dad was a musician, and Landon is one as well… I sing, but technically that’s not a musician). Anyway I love how the blue guitar fits so perfectly in this room and that it gets to be a piece of art on the wall. This is the spare bedroom. We found the bed on Craigslist and I bought those awesome orange curtains for about $1.50 at Goodwill! This is our spare bathroom that we just finished off! It was a huge mess before! It’s so very tiny, so its kinda hard to show off in pictures, but I tried! 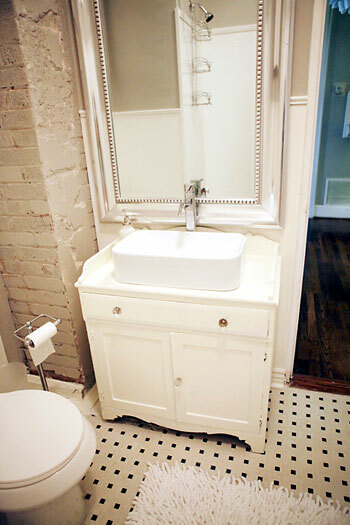 That is your sink and faucet by the way (I was inspired by your bathroom overhaul) so we ordered them and added them to an antique wash stand that we found! 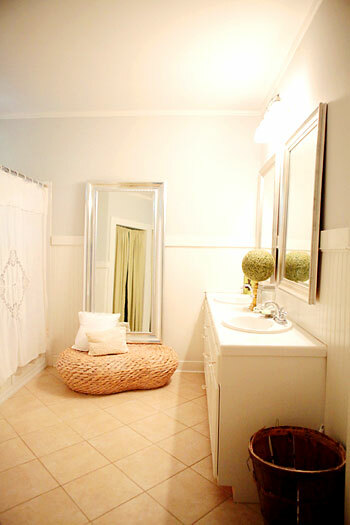 And of course we have another huge mirror, but it really makes this bathroom feel so much bigger! So who’s jealous? Our hands are officially raised. 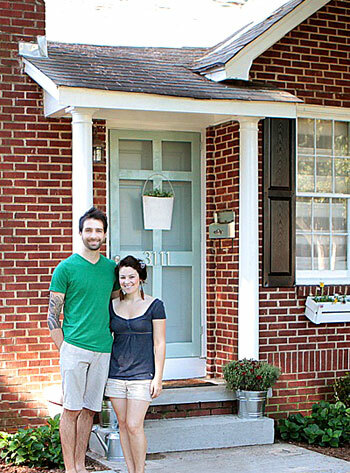 Thanks so much to Jordan and Landon for sharing their home and all of their affordable DIY ideas. We’re sufficiently inspired. What was your favorite part everyone? Hi there, I just wanted to tell those who were wondering about the spare bedroom paint color. 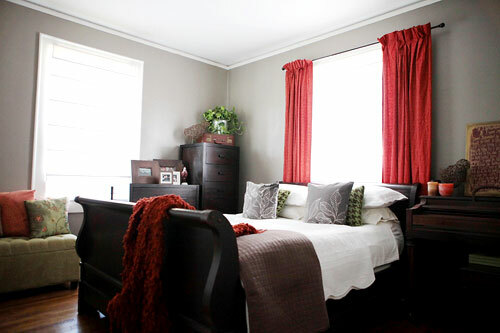 I emailed the picture to Valspar and they replied almost right away saying that the color was “Woodlawn Colonial Gray”. Also they recommended that I go on their website at 9am central time as they give away 1000 FREE samples every day! Sherry and John, did you know that your “Carolina Inn Club Aqua” (did I get it right?) is one of them too? That’s too funny! Amazing. Thanks for sharing! 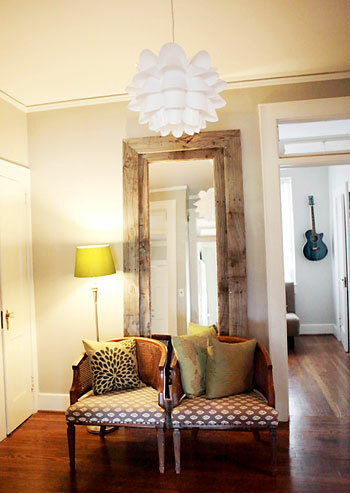 ..I know this is an older post and they probably will not respond, but I am DYING to know how to find a closet door mirror to make the DIY mirror in their kitchen and sitting area. Do you guys have any suggestions?? Thanks a bunch!!!! We’ve seen those at places like Walmart and Target for 5-10 bucks! They come with a cheap plastic frame, but if you add the hefty wood frame it’ll look just like theirs! Good luck. Love their use of color. Great job. PLEASE PLEASE PLEASE share with us how you made the PALLET MIRROS! I have wanted those forever!!! By the way, where do you find rustic pallet wood like that. We are about to buy a house and the sliding closet doors have full length mirrors. Did you leave the glass on the doors to frame it:) Awe inspiring! Just click over to their site for that info! Thanks for the tour, your home is truly beautiful! 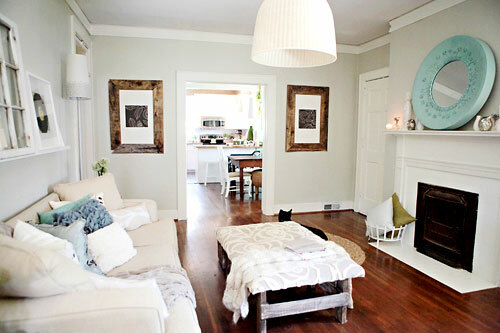 Love love love your house and style! I’m new to this whole design thing and still trying to find my own personal style…..think I just found it. I love all the recycled things in the house mixing the old with the new. i’m obsessed with this house. i sent my husband out the other night for a car load of free pallets. I love love love the beautiful teal mirror over the fireplace! Where is that from??? I think she may have dropped in with that info in the comments if you scroll back. Hope it helps! LOVE THIS!! My husband and I are about to move into a new home that has three bedrooms with 80’s style mirrored closet doors. Yuck! How did you create the mirrors with the closet doors? I would love to see how you did that!! Just saw this couple on The Nate Berkus Show! I knew the pics of their home looked familiar so I did a search here. Awesome home! 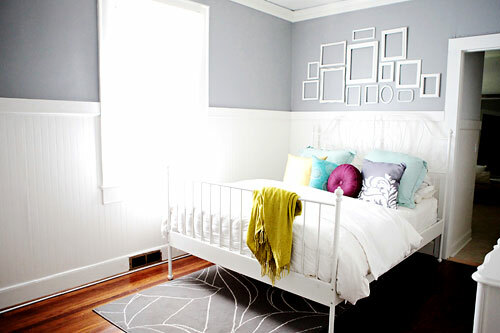 WHAT PAINT COLORS DID YOU USE IN YOUR HOUSE! I LOVE THEM! I would try clicking over to their site to ask them that question for the fastest answer. Hope it helps! i want those mirrors!!!! a diy tutorial on how they made them would be AMAZING!!! This home is so creative and so inviting! 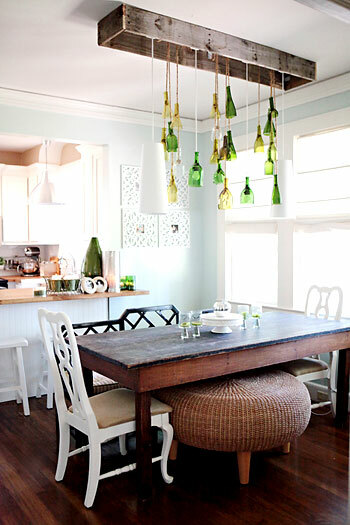 My favorites were the kitchen (maybe because my kitchen is similar with the cabinets if I repaint and get hardware), the pallet mirrors (so beautiful), and of course the wine bottle lighting! Definitely wants to make me create and decorate! LOVE the leaning mirror!!! I recently acquired a mirrored door and I would like to replicate the project but I can’t find any instructions. How was the frame assembled and attached? Also, would it be secure to hang? Thank you! Hope she drops by with that info for ya! I pretty much get everything in our house from Craigslist and the Goodwill. If only I could put things together so visually appealing like you! Please crash my humble abode!! No seriously, can I get some help?